"A New Map of the English Empire in America," revised by John Senex, 1719 London, Daniel Browne and others, 1721 Courtesy of the South Caroliniana Library University of South Carolina. Abraham Alexander, Sr. (1743-1816) Attributed to Lawrence Sully (1769-1804) United States, ca. 1795 Watercolor on ivory Carolina Art Association/Gibbes Museum of Art, Charleston, S.C.
Shepheard's Tavern, Corner of Church and Broad Streets, Charleston Birthplace of the Mother Supreme Council. Allyn Cox, 1959 Oil on canvas Courtesy of Scottish Rite Temple, Washington, D.C.
Leah Lazarus Cohen (Mrs. Mordecai Cohen) (1778-1844) John Canter (1782-1823) Charleston, S.C., ca. 1820 Oil on canvas Carolina Art Association/Gibbes Museum of Art Charleston, S.C.
Mordecai Cohen (1763-1848) Theodore Sidney Moise (1808-1885) United States, ca. 1830 Oil on canvas Carolina Art Association/Gibbes Museum of Art Charleston, S.C.
Phebe Yates Lazarus (Mrs. Joshua Lazarus) (1794-1870) Amélie Dautel D'Aubigny (ca. 1796-1861) France, ca. 1840 Watercolor on ivory Gift of Mrs. Edgar M. Lazarus Carolina Art Association/Gibbes Museum of Art Charleston, S.C.
Joshua Lazarus (1796-1861) Amélie Dautel D'Aubigny (ca. 1796-1861) France, ca. 1840 Watercolor on ivory Gift of Mrs. Edgar M. Lazarus Carolina Art Association/Gibbes Museum of Art Columbia, S.C.
Emma Lazarus (1798-1865) Amélie Dautel D'Aubigny (ca. 1796-1861) France, ca. 1840 Watercolor on ivory Gift of Mrs. Edgar M. Lazarus Carolina Art Association/Gibbes Museum of Art Columbia, S.C. The Last Council of War Meeting of Confederate President Jefferson Davis with his Military Chiefs and Advisors from left to right: General Vaughn, Brigadier General Ferguson, General Bragg, President Davis, Secretary of State Judah P. Benjamin, General Breckinridge, General Dibrell, Brigadier General Duke, and Colonel Breckinridge Wilber George Kurtz (1882-1967) United States, 1922 Oil on canvas City of Abbeville, S.C.
Greenville Army and Navy Store, Greenville, S.C. Jeff Zaglin, proprietor. Lipsitz shoe store, Beaufort, S.C. The Lipsitz family at their new store at 828 Bay Street. 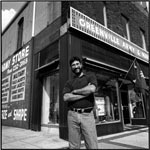 The original store, still in business directly across the street, was established in 1902. Left to right: Joe, Lucille, Michele, Neil, Adam Lipsitz. 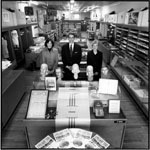 Lourie's men's store, Columbia, S.C. 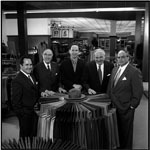 Founded in 1912 in St. George, Sourth Carolina, Lourie's moved to 1437 Main Street in Columbia in 1948. 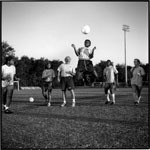 Left to right: Louis, A.M. (Mick), Joel, Isadore, and Frank Lourie. Conestee Mill, Conestee, S.C. 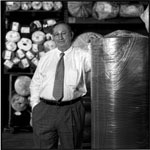 Proprietor Hy Brand in his textile warehouse near Greenville. The original mill building dates from the 1840s. D. Poliakoff Department Store, Abbeville, S.C. Elaine Poliakoff Fenton, Edward Poliakoff, and Doris Poliakoff Feinsilber. Established in 1900 by their Russian immigrant grandfather, David Poliakoff, the store closed permanently in August 2000. 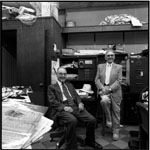 Alwyn's on Front Street, Georgetown, S.C. Alwyn Goldstein and Philip Schneider in the back of Alwyn's store, which went out of business in 1989 in the wake of Hurricane Hugo. 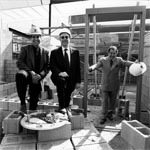 Construction site for Iceland U.S.A., Irmo, S.C. Jeff Selig, Alan Kahn, and Jerry Kline. Iceland U.S.A., Irmo, S.C. Entrepreneur David Bass. 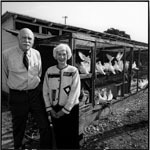 Palmetto Pigeon Plant, Sumter, S.C. Patty Levi Barnett and her twin brother Wendell M. Levi, Jr. 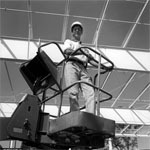 Founded in 1923 by their father, attorney and naturalist Wendell Levi, Sr., and his partner, engineer Harold Moïse, the plant today is the largest squab farm in the world. South Carolina Supreme Court, Columbia, S.C. David I. Bruck, "death row" defense attorney. Allan Sindler, Camden, S.C. At work in his studio on a new piece of sculpture. Warshaw's Going-Out-of-Business Sale, Walterboro, S.C. Proprietor Bernard Warshaw. 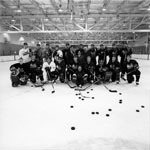 The Stingrays, North Charleston, S.C. Jerry and Anita Zucker and Edwin S. Pearlstine, Jr., owners of the Stingrays hockey team, with players, trainers, and coach during practice at the Carolina Ice Palace. Jerusalem Restaurant, Myrtle Beach, S.C. A glatt kosher Israeli restaurant, with owners Nina and Yossi (Joseph) Elmalih, and Nina's neices, Hanni Logasy and Hanni Zohar. 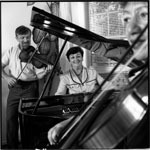 Russian Jewish émigré musicians, Charleston, S.C. Alexander Agrest, Marina Agrest, and Rozolita Agrest. 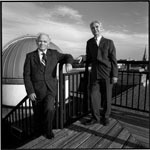 Russian Jewish émigré professors on the College of Charleston Science Center Observatory Deck, Charleston, S.C. Matest Agrest (mathematics and astronomy) and Lev Chernomordik (chemical energotechnology). 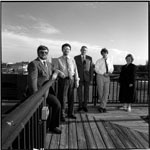 Russian Jewish emigre professors on the College of Charleston Science Center observatory deck, Charleston, S.C. Mikail M. Agrest (physics), Emmanuil Agrest (mathematics), Igor Kogan (engineering), Alex Pecheny (mathematics), Raisa M. Gomer (classics and languages). 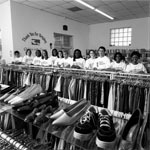 Operation Understanding, Charleston, S.C. Members of a Jewish and African-American youth group at the National Children's Cancer Society Thrift Store. Charleston Police Chief Reuben Greenberg, Charleston, S.C. 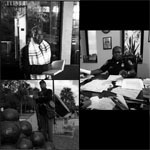 In his yarmulke and tallit, at Conservative Synagogue Emanu-El; in his office on Lockwood Drive; and as a Civil War reenactor in the uniform of the 54th Massachusetts Voluntary Infantry, on the South Battery. South Carolina State House, Columbia, S.C. Left to right: Joel Lourie (House 1998-2004, Senate 2005-present), Isadore E. Lourie (House 1965-72, Senate 1973-93), Hyman Rubin (Columbia City Council and Mayor Pro Tem 1952-66, Senate 1966-84), Sylvia Dreyfus (House 1976-78), David Taub (mayor of Beaufort, 1990-99), Irene Krugman Rudnick (House 1973-78, 1981-84, 1987-93), Arnold Goldstein (House 1970-74, Senate 1975-80), Richard Moses (mayor of Sumter, 1972-76), Harriet Keyserling (House, 1976-92), William Keyserling (House 1993-96), Leonard Krawcheck (House 1967-70). 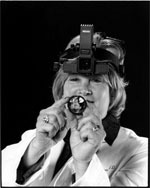 Etta Leah Bluestein, M.D., Charleston, S.C. Ophthalmologist. 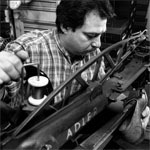 Alex's Shoe Repair, Charleston, S.C. 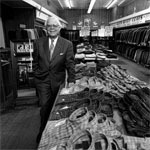 Proprietor Alex Marshtein, Russian émigré cobbler. South of the Border, Dillon, S.C. Amusement park founded in 1950 by Alan Schafer. 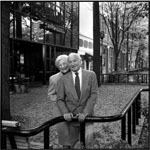 Max and Trude Heller on Main Street, Greenville, S.C. 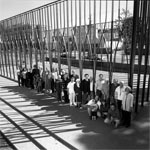 The street's renovation was accomplished between 1971 and 1979, when Mr. Heller was mayor. 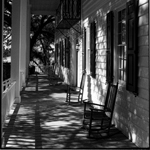 St. Philip Street, Charleston, S.C. 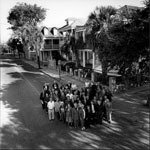 The "uptown crowd" in their old neighborhood. 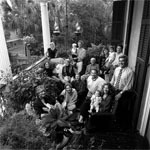 Ziff family, Charleston, S.C. On the piazza of Stephen and Julie Ziff's house on Legare Street. 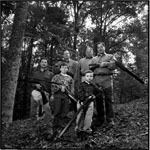 Relative newcomers, nearly two dozen members of the family now live in South Carolina. 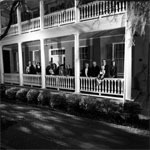 Piazza of the Kaminski House Museum, Georgetown, S.C.
Members of the Moïse family, Charleston, S.C. On the piazza of the historic home of Abraham Moïse, Jr.
Three generations of sportsmen, Spartanburg, S.C. Bob Lyon with sons Robert, Michael, and David and grandsons Craig and Ross. 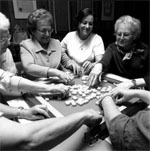 Mah-jongg game at Beth Israel, Beaufort, S.C. Lucille Bass Lipsitz, Rose Yospe Mark, Corinne S. Hagood, and Celia Pinosky Lipson in the social hall of the synagogue. The Queen Bees at Patriot's Point, Mt. Pleasant, S.C. Erin Floyd, Alissa Gilium, Coach Ted Rosengarten, Kendra Coaxum, Miriam Crawford, Estee Perlmutter. 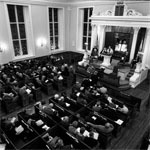 Kahal Kadosh Beth Elohim, Charleston, S.C. Friday night service celebrating the 250th anniversary of the congregation. 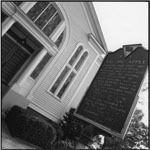 "The Big Apple,"Columbia, S.C. Beth Shalom's first synagogue. When the congregation relocated, the sanctuary became a nightclub where a dance called the Big Apple was invented. 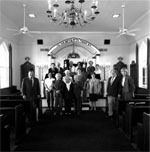 Members of Congregation Beth Israel, Beaufort, S.C.
West Ashley Minyan House (prayer house), Charleston, S.C. Members of Charleston's congregation Brith Sholom Beth Israel at a satellite synagogue in suburban South Windermere. 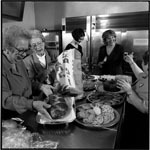 Tree of Life, Columbia, S.C. Sisterhood members preparing the oneg Shabbat in the synagogue kitchen. Catherine Weiner, Libby Paul, Julie Strauss, Sarah Strauss, Mary Helen Baum. 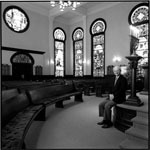 Temple Sinai, Sumter, S.C. Robert A. Moses in the temple's sanctuary, noted for its remarkable stained glass windows featuring Biblical scenes. Temple Beth El, Camden, S.C.
Temple Beth Elohim, Georgetown, S.C. Clockwise from upper left: Deborah Baruch Abrams, Meyer Rosen, Alwyn Goldstein, Rita Levy Fogel, and Philip Schneider. 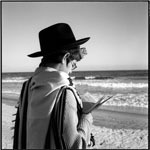 Lubavitcher Chabad (Orthodox day school), Myrtle Beach, S.C. 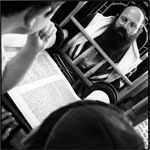 Rabbi Doron Aizenman, director. 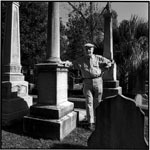 Coming Street Cemetery, Charleston, S.C. Sol Breibart, historian of Kahal Kadosh Beth Elohim and caretaker of the cemetery. 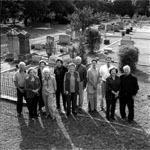 Hebrew Benevolent Association Cemetery, Camden, S.C. Left to right: Harold M. Aronson, Rose Louise Aronson, Carolyn Baruch Levenson, Ella Levenson Schlosburg, Deborah Baruch Abrams, Ann Briskin Baum, Bernie Baum, Cheryl Baum, Garry Baum, Faye Lomansky Levinson, and Arnold Levinson. Holocaust Memorial, Charleston, S.C. Survivors of the Shoah and their offspring at the memorial on Marion Square, near the corner of Calhoun and Meeting Streets. Columbia Jewish Day School, Columbia, S.C. Students light Shabbat candles at Beth Shalom Synagogue. Avram Aizenman reciting the morning prayers, Myrtle Beach, S.C.
Addlestone Hebrew Academy, Johns Island, S.C. Students and faculty of Charleston's Hebrew day school, run by Brith Sholom Beth Israel, gathered under the Angel Oak.